The colonial remnants of Yangon give rise to a feeling of crumbling disrepair that one may experience in other once bustling capitals. Perhaps the crumbling is not as accelerated and disheartening as what can be seen in Havana, but it is difficult to imagine these buildings getting a second life like, for example, the colonial art deco buildings which front the Bund in Shanghai. Before I set off to explore the glorious grounds of the Schwedagon Pagoda, my first taste of Rangoon would have to begin in the heart of the old city center. I walked south from my hotel and passed by a few embassies until I reached the National Museum. Inside were various treasures, gems, statues, and archaeological finds from a bygone era including the grand “Lion Throne” of the last king of Burma — King Thibaw Min — taken from the Royal Palace in Mandalay. After the museum, I continued walking south and made a left on Aung San Road which took me to the Bogyoke Market. 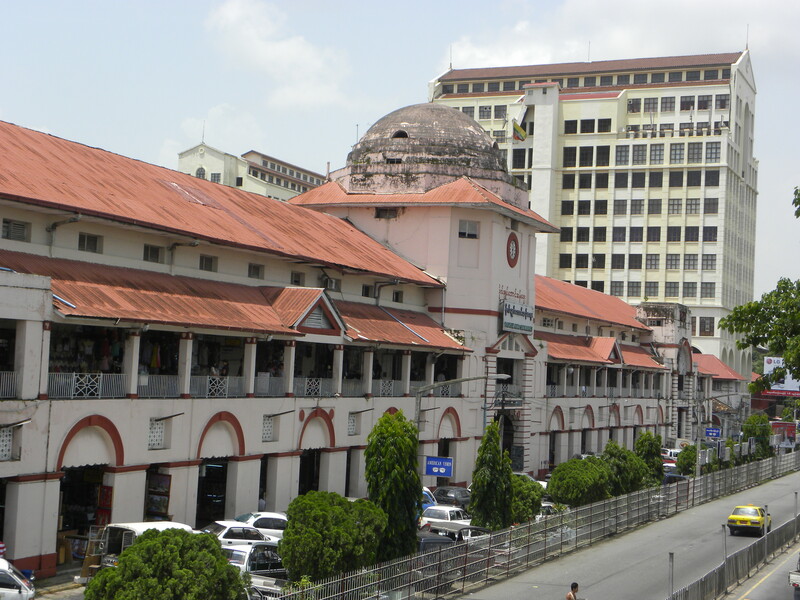 This old Market consists of a large bazaar complex with covered stores, as well as, a labyrinth of alleys and free lancing gem and currency traders. As I walked along, on a few different occasions there were children who came up to me and tried to sell me two books that were in English — one was “Burmese Days” by George Orwell and the other was a Rudyard Kipling collection of poems/short stories which featured Kipling’s “The Road To Mandalay”. Many men and women had swaths of dried ointment on their faces. I learned that this facial paste was a natural sunblock / moisturizer called “thanaka ” and was made from the bark of a mixture of different trees. Thanaka is applied to the face and once it dries it remains visible (mostly under the eyes and on the cheeks). When I first saw the faces of those locals who had applied thanaka to their faces, it brought to mind the facial markings that I’ve seen in documentaries about tribal people living in New Guinea or in the Amazon jungle. I also noticed many men wore a long sarong wrap–called a longyi– instead of pants. This was tied in a knot just above their waist and seemed to be very comfortable. I tried one of these on in the market just for fun, but decided again buying one because I was on a tight budget and didn’t want just buy things based on fancy. 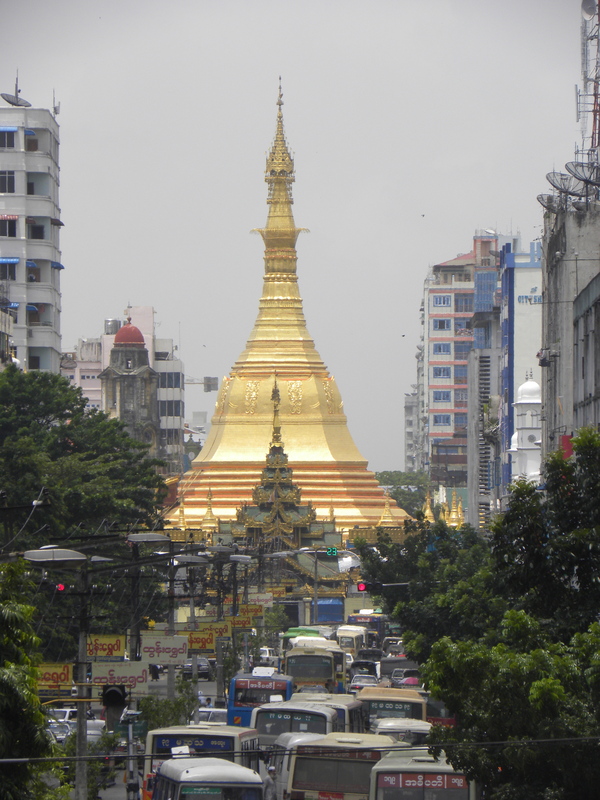 I turned south from Bogyoke Market and onto Sule Paya Road which not surprisingly led to Sule Paya (Pagoda). This sight was at once incredible and incongruous. There before me rose a gold spire which was smack dab in the middle of a major 4-way thoroughfare where a crush of cars, buses, and motos were driving directly to, from, and around it. This Pagoda which had served as ancient spiritual beacon for so many centuries is now a 151 foot high, 2,000-year old, gilded traffic circle!! 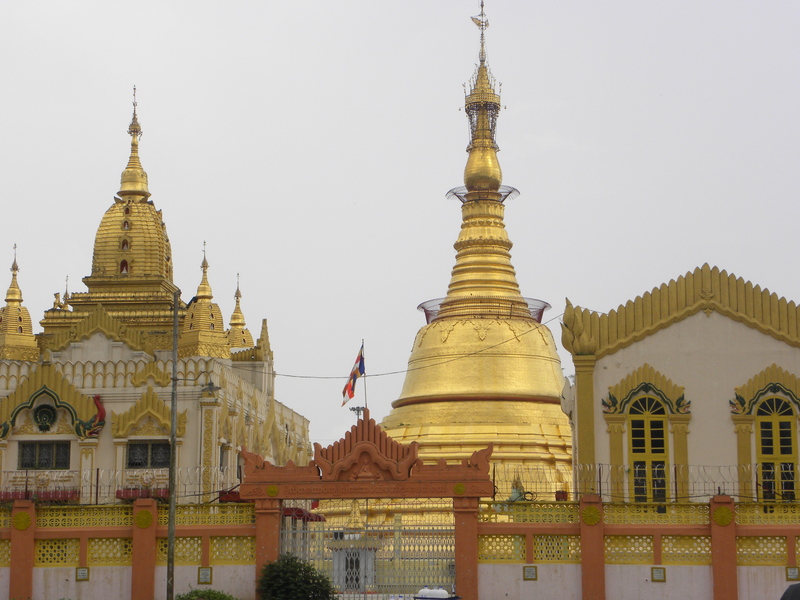 I would have to double back and enter Sule Pagoda later because at the time I was headed to the far east side of Yangon. From Sule Paya, I continued south until I hit Strand Rd and from there I headed east and walked along a path which fronted the Yangon River. I saw a few jetties along the way with boats which ferried people across the river or up and down it to other cities. This walk took me past the old Courthouse, Customs House, the famed Strand Hotel, and other buildings — most of which were dilapidated and abandoned. I was headed to the Botataung Pagoda — which while not as awe-inspiring in terms of its size and design as either the Sule or Schwedagon Pagodas — nevertheless occupies an extremely special place in the Burmese pantheon of Pagodas. As described in an earlier post, “Parinirvana” (see link https://startupkoan.com/2012/08/01/parinirvana), after the Buddha died his disciples decided to distribute the Buddha’s relics — pieces of bone, clothing, hair, and teeth — into eight parts. Whoever received any relic would have to preserve them within the walls of specialized shrines — what became Stupas, Dagobas, or Pagodas — depending on the country in which these were constructed. So, a “Pagoda” in its pure meaning and purpose would have to contain some physical element or connection to the Buddha. But, of course once the relics became encased within the Pagoda, the relic was never seen again, or it was only accessible by secretive corridor or chamber only known by those monks entrusted with its safekeeping. During World War II, Burma was caught between the expansionist dreams of the Japanese and a series of counter-offensives by the Allied forces. Many bombings and firefights took place all over Burma between 1942-1945. One of these firefights completely destroyed the beautiful teak and stilted Burmese Royal Palace in Mandalay. In Rangoon, there were many air raids and during one bombing run (by the Brits) which was to target those docks and jetties being used by the Japanese, a bomb went off course and scored a direct hit on the Botataung Pagoda. This Pagoda which the Burmese believe was first built by their Mon ancestors over 2,500 years ago– at the same time as the Schwedagon — was destroyed in 1943. It wasn’t until after WWII finished and Burma received its independence in 1948 that the Botataung was rebuilt. As the process of rebuilding began and excavations were made, the core relic chamber was found. It was still intact. 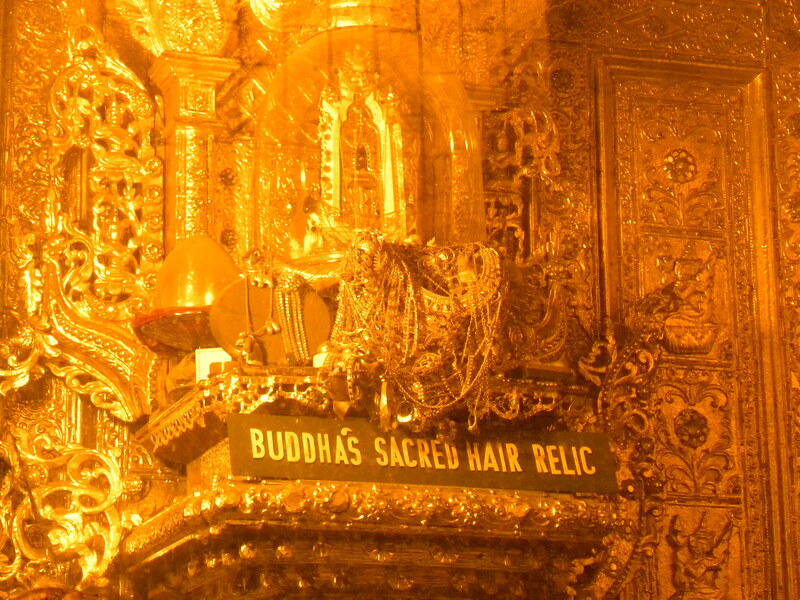 This chamber was opened and inside were statues of the Buddha, precious gems, gold, Brahmanic script documenting the original founding of the Pagoda, and most profoundly — a strand of human hair and bone fragments from the Buddha himself. When Botataung was reconstructed after the war, the Burmese left the interior of the Pagoda hollow and created a maze-like path which allowed anyone to walk through the inside of Botataung. No other Stupa, Dagoba, or Pagoda from the ancient Buddhist world has been opened up in such a way to the public. 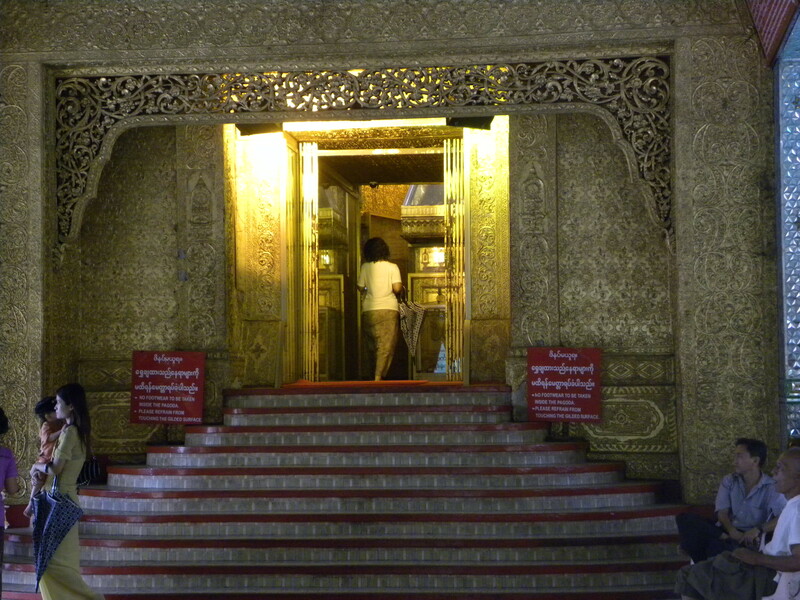 When I entered the Pagoda itself, it was a remarkable moment. I was used to observing such shrines from a purely external perspective. The Buddhist practice is to walk clockwise around a Stupa while reciting mantras or silently contemplating the path towards enlightenment. My practice was to use the circumambulation in order to observe these shrines from every possible angle and vantage point — both near and far. I would absorb the essence of the structure while I stood in wonder of its design, construction, and the purpose it served. Now, I was actually going inside one of these things and entering the mystery itself. So, even though Botataung’s interior passage had only been created some 60 years before, I still had a feeling of converging with something ancient. The inside was entirely gold-plated with plastic shields covering the lower portions of the walls. There were Dharma wheels, Buddhist symbols, and other iconography. I followed a narrow path which took me to a central area that led to an opening. This opening was like a doorway, large enough for only 2 people to stand in side by side, and contained a barrier which prevented anyone from going beyond it. There it was: a single strand of hair curled within a glass case which was enshrined by an ivory frame that was studded with gems, diamonds, and gold. It was difficult to see from where I stood, but it was there. I was alone for a few minutes standing there inside Botataung and I was swept up in deja vu. I was reminded of when I first sat under Jaya Sri Maha Bodhi in Anuradhapura and before that had stood under the Bodhi Tree in Bodh Gaya. These experiences were all physically separate, but were connected and part of the same consciousness. I moved aside when some other people showed up and then I made way out of Botataung. 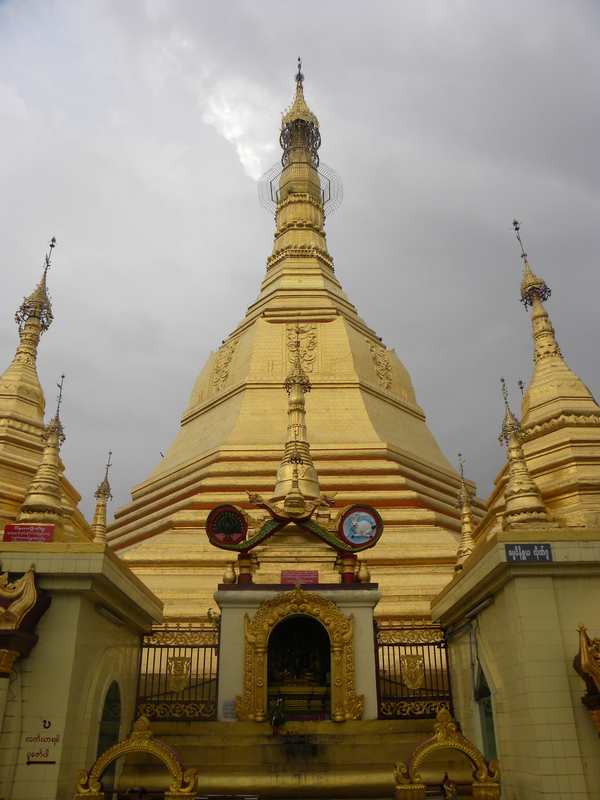 I walked around the central Stupa and came to a separate lime-green octagonal building. 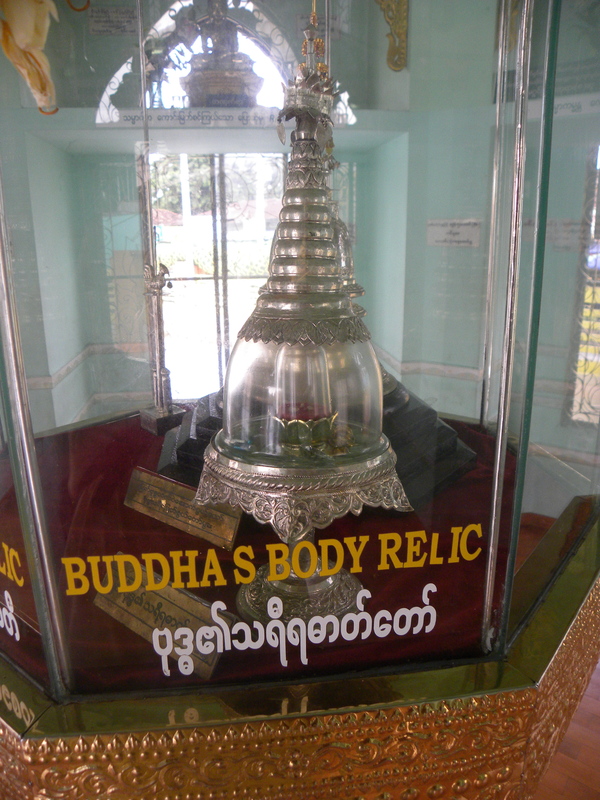 A sign above it said in English: “Buddha’s Body Relic Pagoda”. 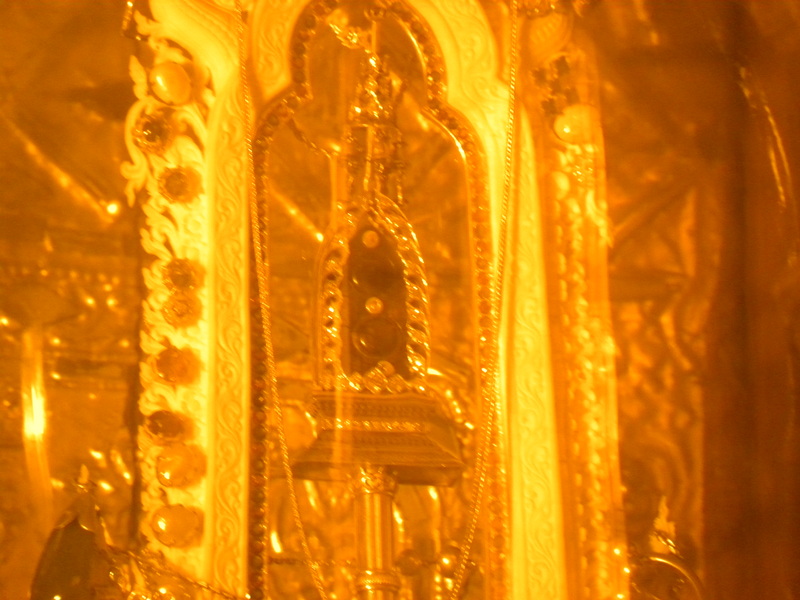 Inside was an octagonal glass display box and within it was a glass reliquary resting on a raised silver stand. 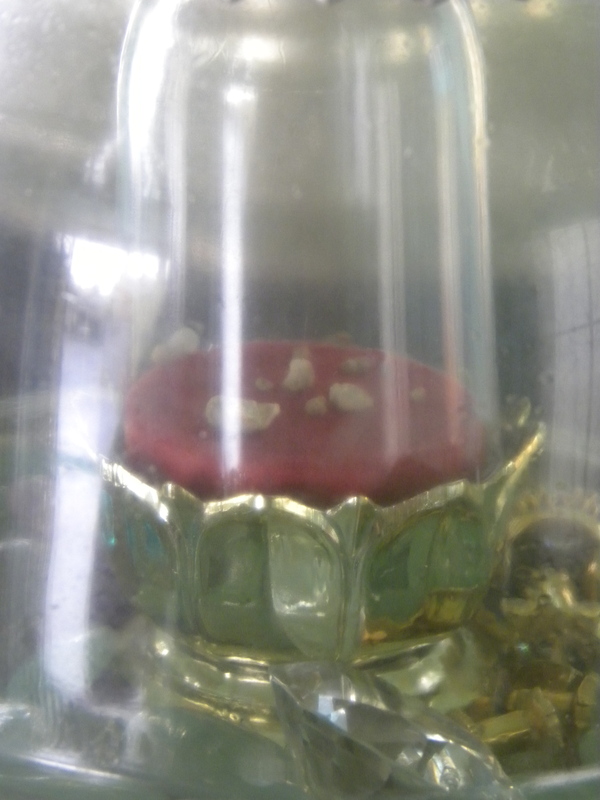 Within this reliquary was another small glass container that sat on a round red cushion which came out of golden lotus flower. I peered in close and saw a few white colored, pebble-sized fragments. Unlike the Temple of the Sacred of the Tooth in Kandy where I had to imagine the Tooth resting within a small chalice within the great golden external shell that was shown to the public, here before me was something visible and unadorned. The fragments were positioned in a triangular manner on the cushion and stripped of any ceremony. But, these were not pieces of decrepit ossified tissue which had long since been sucked dry of their marrow. These were sacraments — corporal keys to understanding. When Christ said “This is my body” and then broke the bread into pieces which he distributed to his disciples this was a deliberate invocation. The Buddha never instructed that his disciples hold onto his physical body. The decision to pick out the Buddha’s relics from his funeral pyre and to then carry them to far away lands for enshrinement was one that his disciples made themselves. So, this idea of ritualized practice where faith is connected to the physical body appears to again be another common trait between Western and Eastern traditions. This practice may have been born out of triggers which were the inverse of one another — that is, the affirmative instruction given by Christ and the absence of instruction given by the Buddha. But, the end result was the same: a transformation of the physical into the spiritual. I felt a deep understanding of this concept at that moment as I viewed these fragments which was strange because I’m not a subscriber to any religion or any kind of disciplined spiritual practice. But, I did feel it…in my bones.